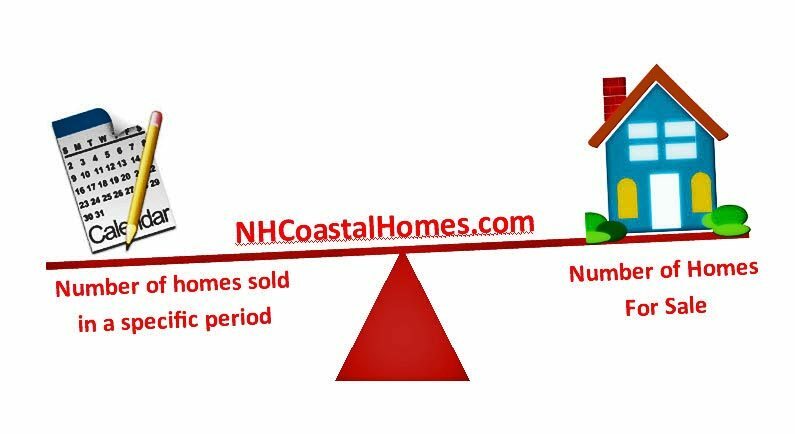 What is the “absorption rate” for Portsmouth NH and the New Hampshire Seacoast homes for sale and why is that number so important? First we need to define exactly what a market absorption rate is and how it’s calculated. The strict definition of an absorption rate is the number of months it would take to sell the current homes listed for sale on the market. Generally around 6 months is known as a “balanced market”, that is one in which neither the seller or the buyer holds an advantage over the other. More than 6 months supply means that houses are not selling as well as they should and some sellers are willing to make concessions to sell their house. Under a 6 months supply means that houses are selling at a brisk pace, the lower the number, the faster the rate of sale. To calculate the absorption rate for your area you only need to know two things: First, how many active listings are there in your market today? Second, how many sales were there in the past 30 days? Looking in the Northern New England Real Estate Network (NEREN) which operates our Multiple Listing Service for the NH Seacoast I see there are currently 70 active listings of single family homes and condos for sale in Portsmouth. Checking the sold data for the month of January I see 22 sales. So if you just divide 22 sales into 70 active listings you the a 3.18 months supply of homes for sale. I would would normally round that up to 3.2 months supply. So what does mean if you are a buyer or seller in Portsmouth NH right now? 3.2 means the market is tilted in favor of the seller because there is such a small supply of homes for sale. To a seller that would mean you can be more aggressive on your pricing and also hold out for an offer that is closer to your asking price assuming it’s realistic. To a buyer that means you need to come in with an offer pretty close to the asking price or you run the risk of not buying the home you want. A short supply of homes for sale also means often multiple buyers are trying to buy the same house and causing bidding wars which runs prices up even above the asking price sometimes. So whether you are a buyer or seller one very important piece of information you should be getting from your Realtor is the current absorption rates in the areas you’re looking to buy or sell in. The Seacoast Board of Realtors surveys 13 NH Seacoast towns for their market data. 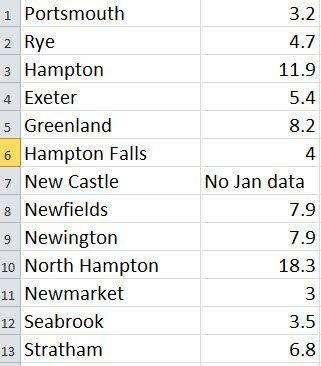 The chart below shows the January absorption rates for those 13 towns of Portsmouth, Rye, Hampton, Exeter, Greenland, Hampton Falls, New Castle, Newfields, Newington, North Hampton, Newmarket, Seabrook, and Stratham New Hampshire. Here are the January 2016 absorption rates for those areas. If you’re thinking of selling your house in the New Hampshire Seacoast or southern Maine area here’s a couple of tools and some information you may find useful. First is our “Property Pricer” tool which will give you an instant price range for your home based on an automated valuation model (AVM). I would like to caution that AVM you get from here and websites like Zillow are not totally accurate because they rely on algorithms based on strictly market sold data and they can’t take into consider the condition of your house, the location, improvements you may have made, and several other factors only an experienced professional can accurately evaluate. Second, our website, www.NewHampshireMaineRealEstate.com has a “Sell” link that offers free staging tips, tips to make your house show better to prospective buyers, and lots of simple fix up, clean up advice that you can do yourself for no or just a few dollars. Things you do to make your house appeal better to potential buyers will pay off big for you in the long run with a faster sale and a higher price. Buyers love homes that are in “Move in” condition and are often willing to pay a premium for them. Visit the “About us” section of our website to review our qualifications, testimonials from past clients, and why you should choose us to represent you in your next real estate transaction. My partner Ann Cummings and I would love to talk to you about representing you in the sale of your house. Our track record of success is long and includes the sale of literally hundreds of houses just like yours. We have the skills, tools, knowledge, and passion to get the job done for you. Give us a call and let’s talk, Ann and Jim, 603-436-1221 direct. If you’ve found this article interesting or helpful chances are your friends will too. Please share it with them via the social media links below. Jim & Ann. Lucky me (I’m assuming you are/will be ) my RE agents..?? ?..I’m not ready yet….I’m sure if I had to…I’d be out fast…unorganized..etc…. I’m dragging my feet. so to speak…emptying certain areas (the basemen& upstairs is almost empty) ..downstairs…doing cupboards….sending items to David’s kids…etc. . I…want to be out at least by next fall …& maybe sooner….How does this meet w. your perspective?? Specifically when I am ready, the month before I’d put it on the market, …I’d have a large POD in my back yard entrance (paved driveway;…used to be the entrance to the added on room;..now a spare bedroom but initially a Beauty Parlor!!) i.e. in the back yard…not the front driveway.. Nancy Main Sawyer. .